When residents in Juneau, Alaska, voted in 2007 to stop community water fluoridation (CWF), oral health care advocates warned officials that the decision would result in an increase in dental caries. A decade later, a new study published in BMC Oral Health backs this prediction with reports that Juneau children under age 6 are experiencing one additional caries procedure per year since the removal of fluoride from the city’s water supply. In the study, “Consequences of Community Water Fluoridation Cessation for Medicaid-eligible Children and Adolescents in Juneau, Alaska,” investigators report children experienced about 1.5 caries-related procedures per year when the water system contained fluoride. Once fluoride was removed, the number of procedures jumped to 2.5 per year for children under age 6. There was also an increase for older kids, according to the study’s authors Jennifer Meyer, PhD, MPH, CPH, RN, an assistant professor in the Department of Health Sciences at the University of Alaska Anchorage, and Vasileios Margaritis, PhD, MSc, DDS, a core faculty member in the College of Health Sciences at Walden University. The team compared the Medicaid dental claim records of 1900 children ages 0 to 18 residing in Juneau’s main zip code from 2003 to 2012—5 years after the cessation of the CWF program. Adolescents and children born after the CWF cessation underwent the most restoratives procedures and incurred the highest caries treatment costs. “The results indicate that without the CWF program, children born after cessation who receive Medicaid and who reside in the 99801 zip code experienced, on average, one additional caries-related procedure annually at an additional inflation adjusted service cost of approximately $300,” says Margaritis. For children under the age of 6, the odds of undergoing restoratives procedures before CWF ended was 51% less than it was after cessation. Evidence of increased sealant placement was also found in the data. Extractions were not included in the study because the claims database did not include the medical record, and, as a result, investigators could not be certain an extraction was caries related. Fluoride is a valuable preventive measure in the fight against caries. Adjusting the fluoride concentration in public water to a safe and optimal level of 0.7 ppm is supported by the US Centers for Disease Control and Prevention, American Dental Association, American Academy of Pediatrics, and other agencies. FIGURE 1. Mean caries restoration costs according to age for children with optimal or suboptimal community water fluoridation (CWF). 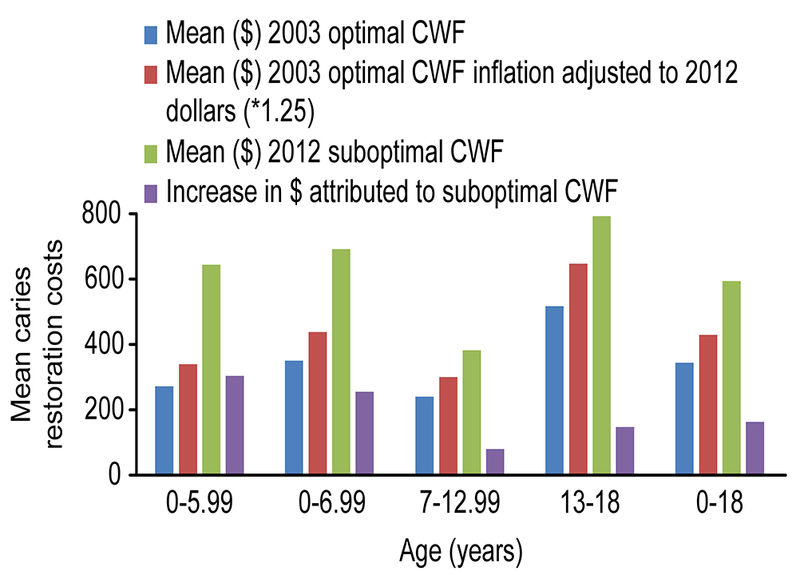 First, the mean cost in 2003 for children with optimal CWF was calculated; the mean cost in 2003 was then adjusted for inflation (*1.25) according to the 2012 dollar value; and lastly the increase cost attributed to suboptimal CWF was calculated. Meyer J, Margaritis V, Mendelsohn A. Consequences of community water fluoridation cessation for Medicaid-eligible children and adolescents in Juneau, Alaska. BMC Oral Health. 2018;18:1–10. At a 2006 City and Borough of Juneau Assembly meeting,1 challengers of the CWF program opposed exposing residents to fluoride without their consent and expressed concerns about fluoride’s affect on infants and pregnant women. Those in support of continued water fluoridation cited sound research showing fluoride as a safe and effective measure in caries prevention. “Dental caries are multicausal, but relatively easy to prevent—especially in younger patients. In addition to drinking optimally fluoridated water, we also recommend practicing good oral hygiene at home, visiting a dentist regularly for cleaning and preventive care, and eating a healthy diet that is low in sugar,” Margaritis notes. Parents and caregivers who do not have access to CWF can talk to their oral health professional about fluoride supplementation. Clinicians can recommend an appropriate level of fluoride for optimal caries management by assessing the patient’s caries risk and exposure to fluoride. “CWF is one of many methods for reducing the risk of caries, and the best part is it requires no individual behavior change or action to receive the benefit,” says Margaritis. The City and Borough of Juneau Alaska. Available at: https://www.juneau.org/beta_transfer/assemblyftp/minutes/2006/2006-11-20-Assembly_Minutes.pdf. Accessed January 24, 2019.